We all know that no two people are the same, and the same is true with our pets. We understand that what may seem like a basic service, such as a dog walk, can require a complete different approach depending on the dog’s behavioral traits. Certified: The professional pet sitters and professional dog walkers at Every Dawg's Dream (EDD) care for your pet like our own. EDD is comprised of pet professionals and specialists certified in pet CPR & first aid. Trained: Because of our training and experience in animal behavior, we are able to observe and recognize each dog’s needs and adjust our techniques accordingly to make certain we get the best results from each service. Rigorously Screened: We also realize that the decision to hire a pet care specialist is not one that is made lightly, after all, you are entrusting someone new to take care of your furry kids and have access to your home. So we want to stress that at Every Dawg’s Dream, Inc., every one of our pet care specialists goes through a rigorous screening process including background checks, ensuring they meet our stringent qualification and hiring requirements so you can have peace of mind knowing you have selected the best specialists with the highest levels of integrity. As you can see, Every Dawg’s Dream is not just another dog walking/pet sitting company…we strive to go above the standard, providing you the added benefits of our knowledge and experience, and through positive reinforcement training, help your pooch live even a more fulfilling life. Mariela Rassouli is a certified professional dog trainer through the Certification Council of Pet Dog Trainers (CPDT–KA), Karen Pryor Academy Certified Training Partner (KPA CTP), and an Associate Nosework Instructor. She is also a member of the Association of Pet Dog Trainers, the Pet Professional Guild’s Association for Force Free Pet Professionals, and Pet Sitters International. Mariela started Every Dawg’s Dream to provide the best professional dog training, dog walking, and pet sitting services in Orange County. 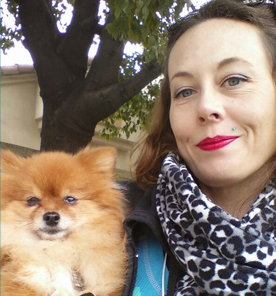 She also helps dogs in the community as a volunteer trainer for Friends of Orange County’s Homeless Pets, spcaLA Long Beach, and Orange County Pit Bull Rescue. Mariela has three dogs at home: Butters, Lance, and Mo. Mariela trained Mo to become a certified therapy dog with Therapy Dogs International, and they frequently visit area nursing homes and hospitals. Mo is also close to earning his Nose Work 1 title, making Mariela a very proud pet parent. Some of her recent workshops and seminars include: ClickerExpo, APDT Conference, a week long Animal Training Seminar at Shedd Aquarium in Chicago with Ken Ramirez, Real Solutions for Canine Behavior Problems, Raising the BaR with Steve White, Living and Learning with Animals - an 8 week Applied Behavior Analysis (ABA) class taught by Dr. Susan Friedman, Puppy Start Right for Instructors Course, and many more. Mariela is currently attending the Certified Nose Work Instructors course. I am a life-long pet owner/dog trainer. I had my first border collie at age 5 and there has NEVER been a time in my life when I have been without (at least) one dog! I am a Certified Training Partner through the Karen Pryor Academy. I have completed the Puppy Start Right for Instructors Course, have my Pet CPR and First Aid Certification, and I am currently studying for the CPDT-KA exam. My experience with training includes countless hours working with rescue dogs through Aussie Rescue and Border Collie Rescue before I had children. I fostered many dogs through the programs and helped to socialize, train and ready them for their forever homes. I competed in confirmation, obedience and found clicker training in the 90’s. I am a positive reinforcement trainer and I am convinced that it is the ONLY way to develop your relationship with animals. I have taken Flopsy through the AKC-CGC title and we aspire to spend some time doing therapy work at local universities during finals time. My professional career has given me a solid business background and I have experience in recruiting, sales, public speaking and teaching adult education through university extension programs. Fun facts: My experience in front of audiences includes 15+ years of professional acting in television and film under my maiden name: Talboy; I am a graduate of UCLA. I am happily married to my French-American husband and we are raising three multi-lingual children in Orange County, California. My family and I currently share our little urban farm in North Tustin with the following menagerie: Flopsy, the dog; cats; rabbits; chickens and goats! Jenn is a long-time owner and lover of dogs. She has an in-depth knowledge of the canine rescue industry and teaching. She is a Karen Pryor Academy Certified Training Partner Dog Trainer (KPA CTP), Certified Dog Trainer (ABC-DT) and Cat Trainer (ABC-CT) through the nationally recognized Animal Behavior College, an Associate Nose Work Instructor (ANWI), an American Kennel Club Canine Good Citizen (AKC CGC) and S.T.A.R Puppy Evaluator, a Level 1 Treibball Instructor, and holds a Canine Freestyle certification. In the rescue industry, she also volunteers her time as the Adoptions Director for CA Labs and More. Along with teaching Nose Work and obedience, she also enjoys practicing and teaching fitness, hiking and camping. I've been dog walking and pet sitting for about 3 years. My background working with animals includes 11 years in veterinary care. I love jogging with my doggy clients, playing fetch, practicing behaviors such as sit, stay, and come. Although I love ALL breeds of dogs, I have a very special place in my heart for Dachshunds, Terriers, and French Bulldogs. I look forward to giving all the love and care your animals deserve while you are away! I have lived in the Anaheim area for my entire life. I have always had a passion for animals of all shapes and sizes. I have had all sorts of pets throughout my life from my loving black lab Whoopie, to my rat Willard, to my current freshwater tank full of fishes, and my newest addition my little praying mantis. My previous animal experience was working at Petco for over 5 years. It was a great experience to work with so many different kinds of animals and learn so much about each kind of furry, feathered, or scaly animal. I was trained in just about every aspect of dog and cat knowledge. Including working 2 years in the grooming salon, as well as dog training, and I have extensive knowledge in food needs for all kinds of breeds. I also worked very closely with an adoption agency known as “Pardon me INC.” Which worked with all different breeds, and homeless dogs with special needs. I take any opportunity I can to be around these wonderful animals, and that is why I am so ecstatic to be a part of Every Dawg’s Dream’s team. I get to do what I love doing, and work directly with you and your furry loved ones. I promise to always keep your furry loved ones safety and happiness as top priorities, and to treat them like they were my own! My name is Helen Koup. I grew up in Brazil, moved to the US in 1999 and now live in Orange County. I used to be a fashion designer working long hours in downtown Los Angeles but working far away from home always made me feel bad for my pets. In 2015 I realized that I had been working in the fashion industry for too long so I quit to become a dog walker/dog sitter. People have always thought I was crazy for having so many pets, but I can't imagine my life without them. I have a special needs dog, a senior cat, and handicapped turtle which I very much love and care for. I've done street animal rescues in LA and Orange County and have been walking and house sitting dogs for the past year. I am certified in Pet CPR and First Aid. Hello, my name is Shannon. I am a Huntington Beach resident and Nursing School Student. I have always been an avid animal advocate and absolutely adore animals of all sizes and types. I am a proud dog mom to a 7 year old blue pit bull named Riley that is the light of my life, whom I was blessed enough to rescue at 6 months of age. Prior to rescuing my dog, I had a cat I adored named Tinkerbell that I had taken in as a stray as a child. I am no stranger to a variety of species and have never come across an animal I didn’t like. In the household I live in, I’m known as a second mom to all the other roommates’ animals in the house (which includes a Chihuahua, Dachshund, a Toy Poodle, a cat, a Green Cheek Conure, two fish, and a snake). I consider animals like my children and am always ready to mother, rescue, or care for any animal in need. I live by the ideology that animals are such a gift of unending and unconditional love and deserve to be treated with the utmost respect and love that we as humans can give to them. I look forward to meeting you and your furry family members soon! I grew up in Los Angeles County. I graduated with a B.A. Degree in Business Marketing from California State University Fullerton and have remained in Orange County ever since. I was working a corporate job for about 10 years until my daughter was born in 1997. I gave up my high stress job to spend more time with my daughter. I also became regularly involved in volunteer work mostly involving the welfare of animals. For the last 10 years, my daughter and I have been very involved with a cat rescue based in Huntington Beach called O.C. Animal League. I foster mom cats with their kittens in my home until they can be adopted. I also take cats to vet appointments, clean kennels at adoption events and manage two adoption websites. All of the animals in my home are rescues. We have 3 cats, 1 rabbit, reptiles and fish, all which live at my home full time. We are also happy to take in any other animals in temporary need of shelter. We have had a menagerie animals getting rehab at my house through the years. I have been working part time for a non profit for the last 8 years. My daughter continues our passion for animals with her current area of study at Cal Poly San Luis Obispo. Now that my husband and I are empty nesters, I am excited to spend more of my free time by pet sitting and dog walking for Every Dawg’s Dream.